Been feeling blue, green, green and pink for the last two days. That's because I have been making these type of wire wrapped bracelets the last few days. This piece here is wrapped mostly with 22ga wire and measures about 19cm but extendable to 20cm as I added 3 jump rings at the end. Ooooooh pretty blue bracelet! 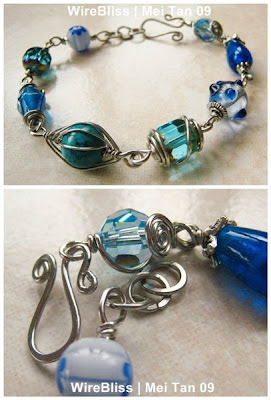 I like a lot :) Yes, you're right - odd beads from the stash can be made into some gorgeous bracelets! I really like this one in particular as I'm a huge fan of blue! Its 20ga Dita. Give it a bit of hammering to harden. I found that thicker wires are better for clasps.